It comes as no surprise that Oklahoma leads the nation in cuts to per-pupil funding since the recent recession. The reduced levels reflect not only the lingering effects of the 2007-09 recession but also continued austerity in many states; indeed, despite some improvements in overall state revenues, schools in around a third of states are entering the new school year with less state funding than they had last year. At a time when states and the nation are trying to produce workers with the skills to master new technologies and adapt to the complexities of a global economy, this decline in state educational investment is cause for concern. Alabama, Arizona, Kansas and Idaho round out the top five in states with the most cuts in per-pupil funding. Maybe most Oklahomans are just too busy trying to figure out which major college football program in the state is the most corrupt to be overly concerned with public education. What’s for sure is that the news of the state’s latest abysmal ranking was overshadowed by the Sports Illustrated articles outlining improprieties in the Oklahoma State University football program. The serious question of why Oklahoma has cut education funding so much is really not that perplexing. The state has a long history of underfunding its educational systems. This is a place where, historically, not enough people place value in education, and the result ultimately is an under-educated population and all the attendant social problems that causes in contemporary society. It’s not that complicated. The other more serious question of what people can do to restore education funding in Oklahoma is not that complicated either. Educators, parents and students need to speak out and rally, and continue to do so, though admittedly they face a recalcitrant GOP-super majority in state government that seems more interested in giving out tax breaks to the rich and corporations than educating its youngest citizens. There is a historic point or comparison to make in relation to the decline in education spending. In 1990, the late Gov. Henry Bellmon, a Republican, pushed through House Bill 1017, which was a sweeping educational reform measure that reduced class sizes and significantly raised starting teacher pay. The bill came after years and years of inadequate education spending. Voters actually approved higher taxes in 1991 to pay for the increase in funding. Many Republicans opposed the measure, but there was enough grassroots support to do the right thing for once when it came to education. Fast forward to 2010 when State Question 744 was on the ballot. SQ 744, if approved, would have required the state to fund education at the per-pupil regional average of neighboring states. Unlike in 1991, that measure was vehemently opposed by Democratic and Republican leaders alike, and it went down in a humiliating defeat for its supporters. The discrepancy between the two elections in 1991 and 2010 says much about the growing demonization of taxes and education among the right-wing here and elsewhere, but, unfortunately, those prominent Democrats who opposed SQ 744 contributed the most to its demise and probably helped ensure even more cuts to education in the future. 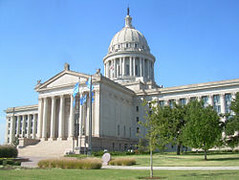 More than 80 percent of Oklahoma voters in 2010 opposed “average” funding for education. What does that say about the state? How do you get more funding for education after a vote like that? Here’s the bottom line given the current political reality: Any substantial increase in education funding here seems unlikely in the near future. That doesn’t bode well for the state’s future. Educators need to keep fighting.